The Model E Indoor Rower requires the installation of the front and rear legs, the monitor arm, pickup cable, and the Performance Monitor using a total of 10 screws. We include the necessary tool and clear, illustrated instructions. Allow about 30–45 minutes for the job. 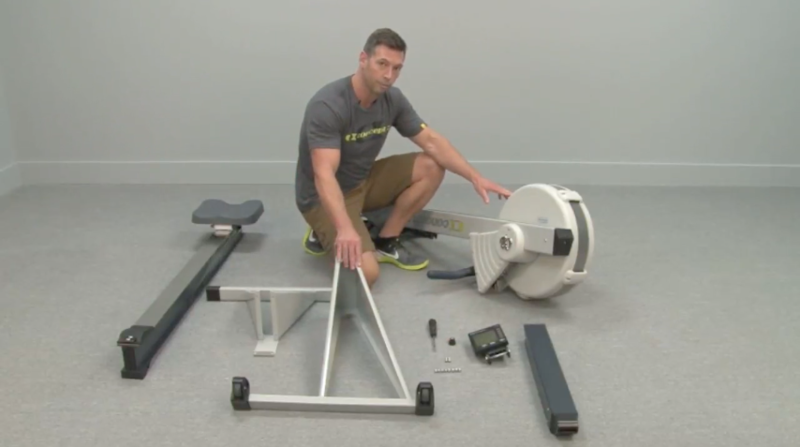 Once all the installation steps are completed, you will need to connect the monorail end of the indoor rower with the flywheel end. This procedure is illustrated in the assembly instructions, or refer to the following video. Box 3 Note: The nut and bolt shown as part of the contents for Box 3 are installed in the case back of the Performance Monitor; they are not loose in the box.